Why Not Me? Is an open and honest collection of essays written by a celebrity that I truly admire, Mindy Kaling. 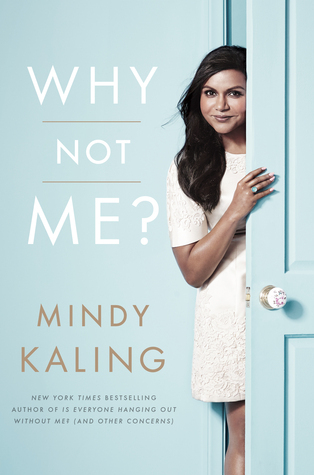 In this book Mindy discusses a variety of personal and hilarious stories that take place from her days as a college student to her current career as the show runner and star of the Mindy Project. Mindy covers topics ranging from gender equality, relationships and rise to celebrity. The theme that really stuck out for me was her wave of self confidence. Her self-esteem and comfort in her own skin is a trait I hope other readers pick up on. It is definitely a characteristic to admire. Why Not Me? is a fun and quirky book. Mindy Kaling fans will definitely enjoy getting a glimpse into her everyday life and maybe even learn a lesson or two from her wise words. I definitely recommend emptying your schedule before picking up this book because you won't want to put it down.